St. Clair Beekeepers Association | Promoting interest in bees and beekeeping in Southern Illinois. The next meeting of the St. Clair Beekeepers Association will be held Friday, March 29, 7:30 p.m. at the St. Clair County Farm Bureau, 1478 IL Rt. 15, Belleville IL. 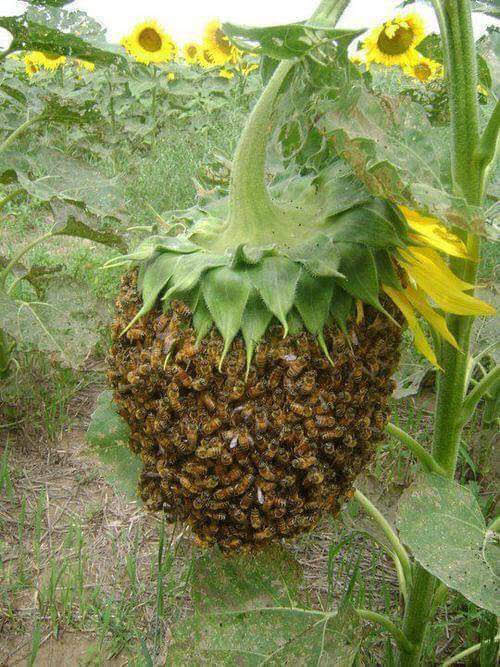 The program will be swarming: Why it happens, how to discourage it, and when the bees do it anyway, How to catch them. We will also cover swarm traps a good way to prepare for the inevitable. New beekeepers are invited to bring their questions for a Q & A session just for them. Doors open at 7:00 p.m. Bring a side dish to share. 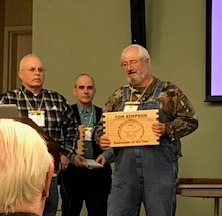 SCBA Director Tom Simpson named Illinois State Beekeeper of the Year Tom Simpson accepts the 2018 Beekeeper of the Year award from the Illinois State Beekeepers Association (ISBA) November 10, 2018. Congratulations, Tom! Unfortunately, European Foulbrood is showing up once again in area hives. If you see a spotty brood pattern call Inspector Eleanor Schumacher at 510-285-7879. Check out Bill Mattatall’s Follies of a Beekeeper here or on the What’s New page! The St. Clair Beekeepers Association was founded July 15, 1917 in Belleville. 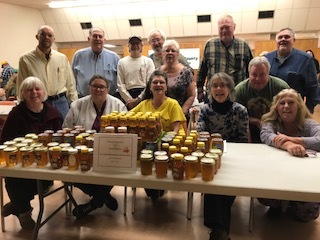 To celebrate our 100 years club members donated 100 jars of honey to the Salvation Army Food Pantry in Belleville and the Crisis Food Center in Alton. Pictured above with the 100 jars of honey they donated are (back row, left to right) Kevin Wilke, President; Ray Chapman, Larry Loveless, Tom and Gay Simpson, Bob Albrecht, Tom Cairns; (front row, left to right) Barbara Beal, Vickie York, Julie McKinney, Charity Davis-Woodard, Jeff Keller, Beth Keller. Not pictured: Anita Castagna, Ken Schaefer, Don and Dawn Huckelberry, Dan and Stacey Amilian. Need a Mentor? We can help – Mentor List. If you would like to be a mentor, please email stclairbees@gmail.com. We’re updating our Swarm List and Cutout List. If you would like to be included on the Swarm List and are a member of SCBA you may be listed for up to three counties. Please send your name, location, preferred counties and contact info to stclairbees@gmail.com. If you have been listed in the past please check the list to make sure your information is correct. If you no longer want to be included, please email stclairbees@gmail.com. If you would like to be on the Cutout List please email your information to stclairbees@gmail.com. Corrections and removal from list, please email. It’s time to register your hives. It’s easy. It’s free. It’s required. Contact Inspector Eleanor Schumacher (510-285-7879). Want to join the St. Clair County Beekeepers Association? Dues are $20 per year. Email Treasurer Vickie York or call her at 618-288-1846.